Welcome back to X-ual Healing, the weekly recap column where we obsessively read every X-Men and X-Men-adjacent comic that Marvel publishes, tell you what happens, provide additional context where necessary, and examine whether the comic makes good use of the long and convoluted history of the X-Men by referencing it in a way that’s accessible to new readers — because we here at X-ual Healing love the X-Men, and we want everyone else to love them too. If you need to know more on the premise of this column, check out the longer explanation here. PREPARE FOR THE WEDDING OF THE CENTURY! • LYDIA NANCE, the anti-mutant lobbyist, and 0101, the most advanced Sentinel on the planet, have found each other. 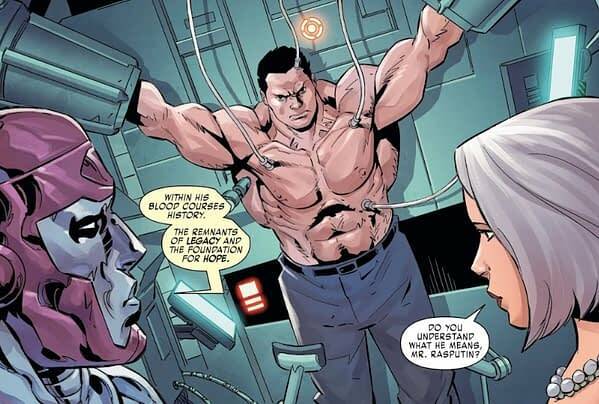 • Kill the X-Men — starting with COLOSSUS. 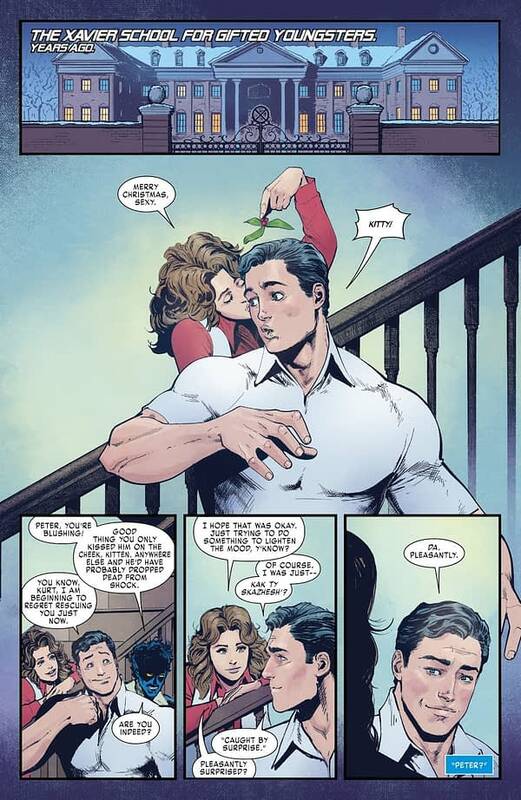 Kitty Pryde and Colossus are getting married soon. There’s a special wedding issue planned with Chris Claremont writing a story and everything. So it’s really inconvenient that we saw Piotr kidnapped by super nanotech sentinel AI, Alpha, during his bachelor party last issue. Hopefully the X-Men are able to get Piotr back in time for the wedding! Ah, young (and potentially illegal) love. Anyway, in Las Vegas, Gambit, Nightcrawler, Iceman, and Fake Pyro are coming to grips with the fact that they lost the groom at his bachelor party. Back in Central Park, current home of the Xavier Institute, Storm and Rachel engage in some X-pository dialog. Storm is concerned that her Asgardian hammer made for her by Loki, Stormcaster, is dangerous as it “nearly took her mind” the last time she wielded it. Storm points out that both she and Rachel are becoming more powerful, and both should be concerned. Rachel is mostly angry at Nightcrawler, her boyfriend now, for breaking her confidence and squealing to the X-Men about her slowly transforming back into a hound. This scene references both X-Men Gold #25 for the return of Stormcaster and X-Men: To Serve and Protect #3 for the time it nearly took Storm’s mind, making up for earlier. 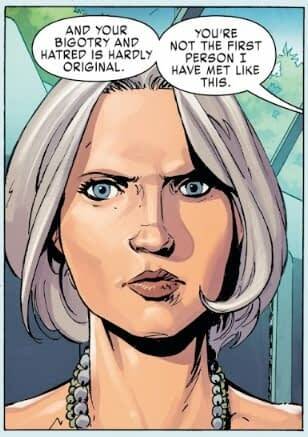 Rachel tells Storm to back off, mom, but Rogue interrupts and next thing we know Storm, Rachel, Rogue, and Kitty are on a plane heading for Vegas. In-flight, more X-pository dialogue explains who Alpha is — a nanotech-powered mutant Sentinel AI who Kitty fought back in X-Men Gold #6, and also illustrates that Rachel’s powers are growing because she’s able to read Iceman’s mind across the country. Sadly, they’re heading in the wrong direction, because Piotr is currently held captive in the Savage Land, where generic anti-mutant villain Lydia Nance is headquartered. 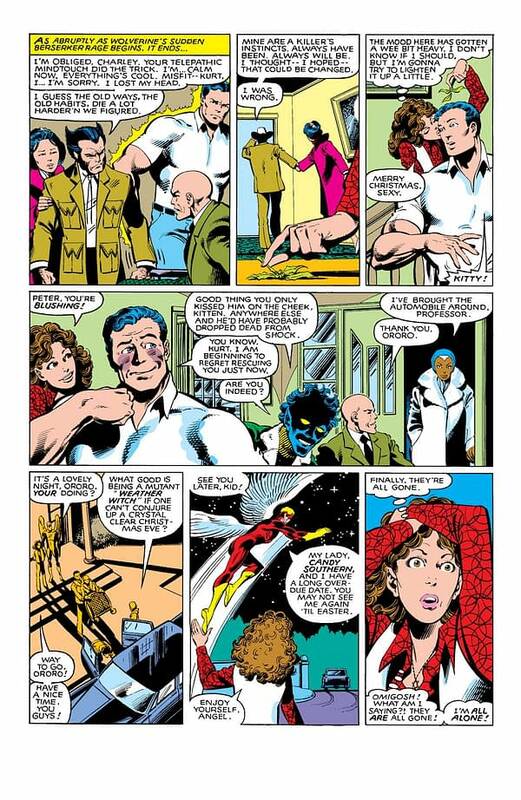 Alpha and Nance want to extract the Legacy Virus, a major ’90s plot point that killed lots of mutants that Colossus died to help cure back in Uncanny X-Men #390, though the comic weirdly fails to give us a reference to that issue or the storyline in general, out of Colossus’s blood. Back in Vegas, Rachel comes to term with her hound-ness and agrees to use her powers to “hunt” for Colossus. That’s sure to end well. Meanwhile, Rogue isn’t buying the idea that Marvel would shockingly kill off Piotr right before his much-advertised wedding, so she tries to get Kitty to plan her bachelorette party while they search for her boyfriend. Bobby announces that Rachel has found Piotr and everyone gets back in the plane to head to the Savage Land. Once there, Kitty leads an invasion of Nance’s facility as Alpha and Piotr discuss Alpha’s character motivations. Piotr wants to know why Alpha hates mutants so much when he himself is a kind of mutant. Alpha says realizing how dangerous he is makes him understand all the more how bad mutants are, or something like that. After he’s done killing all the mutants, he plans to kill himself too. Storm, Iceman, and Fake Pyro stumble upon a nest of Alpha-controlled sentinel bodies at the same time as Kitty, Rachel, and Nightcrawler stumble upon Lydia Nance. Kitty lunges for her, but Nightcrawler and Rachel pull her off and warn her that Nance is a civilian. Uh, no, we’re pretty sure she’s fair game at this point, considering she’s running a sentinel factor in Antarctica and kidnapped Kitty’s fiancé. Choke away, Pryde! Any jury would recognize that as typical supervillain behavior. Nance has an Alpha of her own with her, and a fight breaks out. Now Gambit and Rogue are also fighting with Alphas. Everyone is fighting Alphas! Eek! All of this is a distraction, however, to keep the X-Men from stopping Alpha prime from blasting off in a rocket with Colossus. Next issue, it’s X-Men Gold… IN SPAAAAAAACE! The plotlines in X-Men Gold are all starting to pay off, making the book the most exciting its been since launch. References to the past are great, but we’d prefer they were more consistently linked to issue numbers or storylines so that readers could explore X-Men continuity more easily. There’s a good chance all of these X-Books will get rebooted in some fashion in the Fall, which means we could be building toward a big finale in all of them. With that in mind, the issue ends with a single-page epilogue set 20 years in the future, with Kitty rallying a team of X-Men to fight some giant sentinels. She mentions loved ones being killed over the past twenty years. 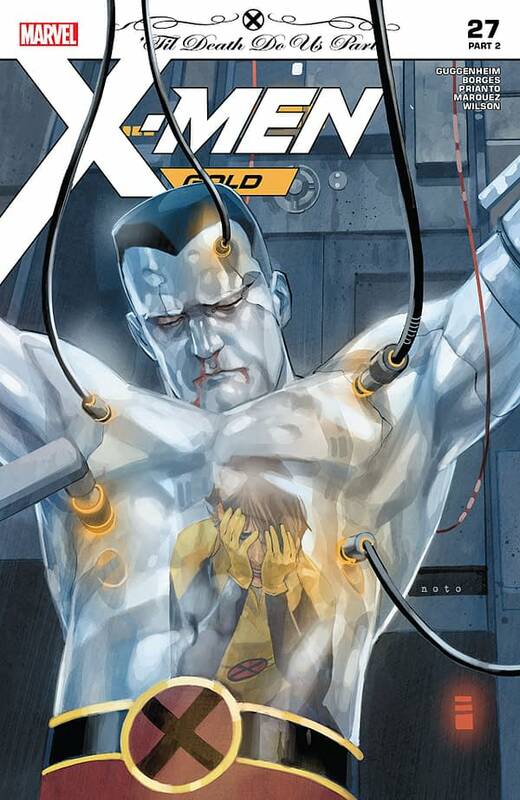 Is it worth noting that Colossus is not in the scene?! We’ll find out in the upcoming X-Termination event comic.